Freezing cold temperatures, ice, snow – it’s that time of year again. Winter. There are not many people that enjoy the cold weather. I, for one, hate it! An hour long ride to work in the snow is not my idea of a good time. 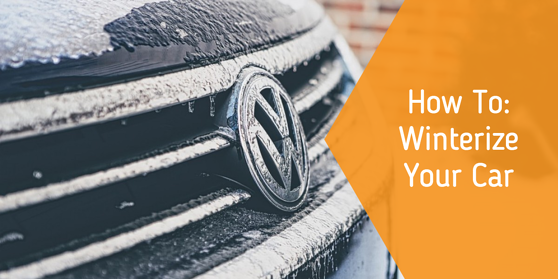 So take it from someone who knows how to get your car prepared for winter, it can be a process! Here are some simple tips to winterize your car and make sure it's ready to get you from point A to B safely. Emergency Kit. In case you become stranded, you should always keep an emergency kit in your vehicle. Some materials include flares, blankets, boots, flashlights, engine oil, washer fluid, and coolant. Snow Tires. For maximum traction and control in the snow, be sure to equip your car with snow tires. They won’t prevent skidding completely, but they are much safer than regular tires. Fuel and Oil. Always be sure your gas tank is full, and your oil is being closely monitored! Not only can you become stranded, but running your car on empty fuel or oil can cause damage. Car Batteries. Batteries work harder in the winter months. Be sure to check yours before the cold weather. Driving in snow and ice is dangerous, no matter what. By keeping these simple tips in mind when winterizing your car, it will allow you to be as safe as possible in winter conditions. So, now that your car is ready for the snow, take out the hot cocoa, sit by the fireplace, and make the best out of the cold, long, winter months. Remember, spring is right around the corner! Remember, if you're uncomfortable with the driving conditions, DON'T DRIVE! It's better to be safe than sorry. But if you're looking to improve on your skills, one of our highly qualified educators can work with you to get where you want to be.